Have you been thinking about picking up a new hobby in California? Maine? Or anywhere in between? Many motorcycle enthusiasts have been looking for a new hobby that will take them to the great outdoors, yet still provide thrill and excitement. 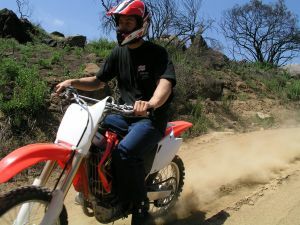 Although it is required to obtain a license to ride a motorcycle on the street, dirt bike riding is a little different. There is no license required to ride a dirt bike in California, Maine, or other states. But, because you do not need a license does not mean that it is easy at first. Dirt Bike riding is a sport that takes practice to become good at. There are many things to learn about dirt bike riding before just hopping on a bike. Here are a few things you should know before hitting the trails. Starting a dirt bike. Be sure to know where everything is at on your dirt bike. Locate the brakes, throttle, clutch, gear shifter, and choke. Kick the gear shifter, and slowly kick it back up into neutral, you should be able to roll your bike back and forth freely. Kick start your dirt bike, bring in the clutch and kick it into first gear. Be sure you are not sitting too far back on your dirt bike. When you take off if you are too far back you will flip backwards. Shifting gears. It is very important that when you shift gears that you take off the gas and then pull the clutch. If you do not let up on the gas, you will “power-shift” which will ruin your transmission. Practice. Be sure to practice at a slow pace until you become familiar with stopping, taking off, and turning corners. Dirt bikes can be sensitive and easy to lose control over. Because dirt bikes are meant for rough terrain, you will want to practice in that environment. Be sure to take it slowly at first for your safety. Throughout the Unites States from CA to ME there are many dirt bike trails and tracks where you can enjoy the thrill of riding. Many state parks will have trails for you to enjoy. If you are in need of purchasing a dirt bike for the first time, USA Powersports has a wide variety of used dirt bikes for you to learn on. Be sure to stop by our showroom and find the perfect size dirt bike for you! If you are interested in selling a dirt bike please contact us at 1-800-963-9216 or fill out our online quote form.